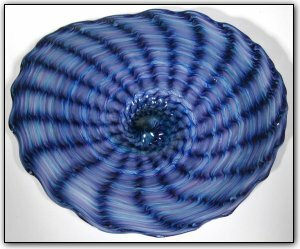 This wallbowl features a scalloped design and features a mix of purples, blues, and pinks all swirled together. Scalloping is a complex technique which uses an optic mold during the glass blowing process. Make sure to zoom in and look at the the swirl and 3D effect of the scallops to truly appreciate this work of art.